Stayed one night. Nice owner. Gravel site level and long enough to stay hooked up. Full services. A lot of road noise all night long. We had a site in front near the road. Probably much quieter in back. Nice place. Well maintained with nice owners with only downside being the road noise. Good value. Would stay again. We camped at Crossroads RV Park in a Fifth Wheel. Park right off US 69 and by a Railroad track some road noise but the trains were few and far between. All gravel but did not have much dust. Within a ten mile radius there was 2 Walmarts and a Lowes, Muskogee is about 5 miles South and you can find almost anything you want there, if not Tulsa 40 miles to North West. Staff very friendly and helpful. A lot of pull through sites. We will be back. Stayed in a 40 foot Class A We camped at Crossroads RV Park in a Motorhome. Friendly owners and staff make this a great stopover. There are a number of residents in the back of the park, but nightly folks are right up front. There is a bit of highway noise as the traffic light right in front of the park causes the 18 wheelers to gear up and down. This park is for sale, so its future is uncertain. We camped at Crossroads RV Park in a Fifth Wheel. Nice friendly park staff, sites are a mix of side by side (all pull thru) back in sites are not side by side lots of grass would stay again. 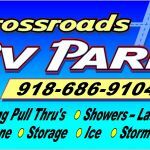 We camped at Crossroads RV Park in a Motorhome. This was just an overnight stop. Easy in and out. Very clean shower house and restrooms. Friendly staff. Great park for an overnight, but not a destination park. We camped at Crossroads RV Park in a Motorhome. We spent a month in the Muskogee area and liked Crossroads. It’s mainly long-term and permanent residents. No pool or playground for the kids, but Muskogee has plenty of parks, and the library issues temporary cards. Easy in/out for short-term stays, and good location if you’re working in the area for a while. WiFi is available, but speeds aren’t that fast. Rate reflects a 30-day stay for a family of 9. We camped at Crossroads RV Park in a Fifth Wheel. A good overnight stop when driving through, but not a destination. Basically a two level gravel parking lot with RV hook ups. Mostly pull-through sites. Trees around the perimeter, and the area was fairly clean. Propane is available. Just off of Hwy-69 but it was fairly quite. At the price, it is an good alternative to a Wal-Mart lot. We would stop here again when passing through. Address is 6476 N. 35th Street West, Porter, OK 74454. 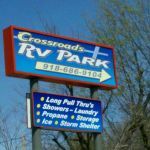 We camped at Crossroads RV Park in a Motorhome.